AID San Diego, in partnership with the Seshan family and Academy of Indian Music (AIM) San Diego would like to invite one and all to an enthralling evening of classical instrumental music. 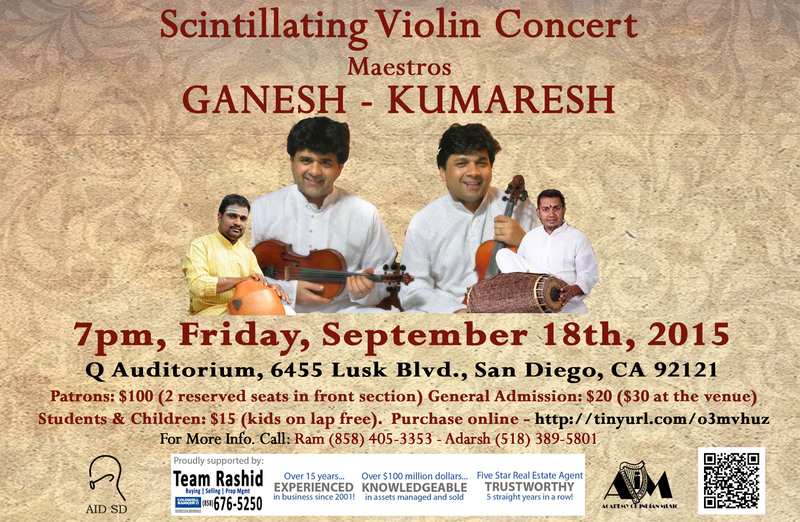 The world-renowned vilionists Ganesh-Kumaresh, also known as the Violin brothers and Fiddling Monks, would be performing at Qualcomm Q-Auditorium, San Diego on 18th September, 2015 at 7 pm. They would accompanied by Trichy Krishnaswamy on the Ghatam and Sankaranarayanan Ramani on the Mridangam. Tickets are available online at this link: :BUY TICKETS HERE. Please join us to witness this exciting concert. Inform your friends about it and bring them along too. Like us on our Facebook event!!! Haven’t heard about Ganesh-Kumaresh? Watch some of their videos by the violinist brothers (Clip 1 and Clip 2). The brothers Ganesh and Kumaresh have been performing from a very young age of 10, and were considered child prodigies. Since then, they have performed in various countries and are considered the leading contemporary violinists in Carnatic music. All the proceeds of this concert would go to supporting grassroots projects in India supported by AID, and also supporting House of India and Ekal Vidyalaya.